Detroit-based Motorcity Casino has appointed Raymond Bertschy as its new executive chef. In his new position, Bertschy will be responsible for managing all culinary activates throughout the property. Bertschy, of Detroit, was previously the assistant vice president of food and beverage at Best Sunshine International in the Northern Mariana Islands, Saipan. 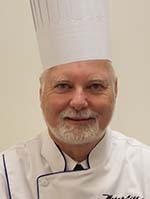 He has 26 years of culinary and management experience, and he has worked at a variety of establishments including restaurants, hotels, casinos, convention centers, sport venues, and more. He is a graduate from the Culinary Institute of America in Hyde Park, New York.